Put Your Questions To Paul Weller! – Paul Weller News! 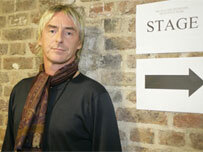 Put Your Questions To Paul Weller! Rooted almost exclusively in English culture and the glory days of The Who, Kinks and Small Faces, Weller needs scant introduction as the leader and driving force behind the formation of two iconic London bands, The Jam and The Style Council. Revered for being a prime influence on Brit Pop, he is alone amongst punk’s Class of ’76 to enjoy a successful and continuing solo career, winning recognition with a lifetime achievement honour at the 2006 Brit Awards. The Woking born singer/songwriter turns 50 this month and has invited fans to send questions about his life and career as he releases his ninth studio album, 22 Dreams, ahead of a couple of summer festival appearances and a full UK tour later this year. And Weller has also penciled in an interview with 94.9’s Gary Crowley, to be recorded on Monday 2 June for broadcast at a later date, which will be devoted to a selection of the questions YOU come up with. “I’d rather go and get a job working on a van or the builders…” ! Next Entry FULL 22 DREAMS PREVIEW AT NME…NOW!